From left, Lori Emerich, assistant manager at Royer’s Flowers in Lebanon, and Kristen Snoke, community outreach director, Pennsylvania Breast Cancer Coalition. It may be the season of red and green, but pink also holds a prominent place at Royer’s Flowers & Gifts. Royer’s employees this fall raised $520 for the Pennsylvania Breast Cancer Coalition with their purchases of pink polo shirts. For each Royer’s-logoed shirt they bought, the employees contributed $10 to the nonprofit coalition. Royer’s employees undertook a similar fundraiser in fall 2016, collecting $1,510 for the coalition for the two years combined. Meanwhile, since 2015 Royer’s has raised another $7,730 for the coalition through the year-round sale of its “Power of Pink” arrangement. The Lebanon-based coalition (pabreastcancer.org) represents, supports and serves breast cancer survivors and their families in Pennsylvania through educational programming, legislative advocacy and breast cancer research grants. Employees of Royer’s Flowers have donated $990 to the Pennsylvania Breast Cancer Coalition. The contribution reflects the employees’ fall purchase of pink polo shirts bearing Royer’s logo. The sale of each shirt raised $10 for the Lebanon-based nonprofit. The coalition (pabreastcancer.org) represents, supports and serves breast cancer survivors and their families in Pennsylvania through educational programming, legislative advocacy and breast cancer research grants. Photo: From left, Candace Oliver, manager trainee at Royer’s Flowers in Lebanon, and Kristen Snoke, community outreach director, Pennsylvania Breast Cancer Coalition. Oliver is wearing one of the pink polo shirts Royer’s employees purchased to raise money for the coalition. Greg Royer, president and CEO, Royer’s Flowers, and Kristen Snoke, community outreach director, Pennsylvania Breast Cancer Coalition. 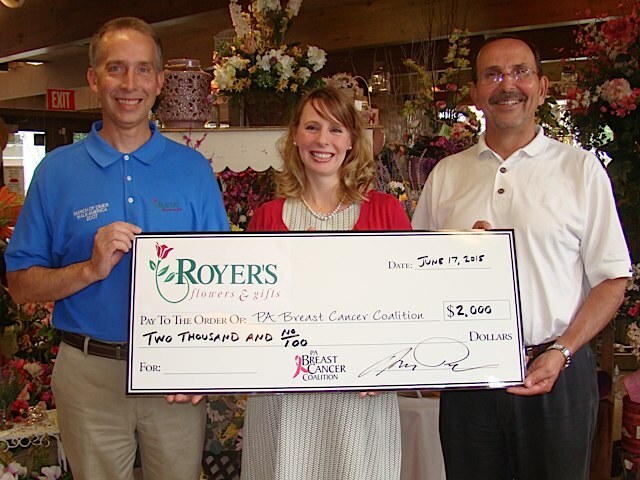 Royer’s has donated $3,090 to the Pennsylvania Breast Cancer Coalition. The donation will support breast cancer survivors and their families and breast cancer research in Pennsylvania. With every sale of its “Power of Pink” arrangement, Royer’s donates $10 to breast cancer organizations. The arrangement is available year-round. Based in Lebanon, the Pennsylvania Breast Cancer Coalition (pabreastcancer.org) represents, supports and serves breast cancer survivors and their families in Pennsylvania through educational programming, legislative advocacy and breast cancer research grants. Royer’s fall catalog will arrive in mailboxes just as October ushers in National Breast Cancer Awareness Month. The catalog includes a new version of our “Power of Pink” arrangement, which is offered year-round to raise money for breast cancer awareness. 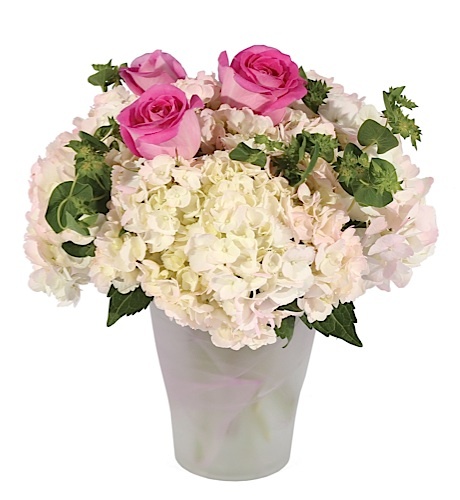 The new arrangement features hydrangea and roses in a swirled glass vase and measures 12 inches high and 11 inches wide. It is priced at $56.99 and can be ordered online, over the phone or in-store. With each arrangement sold, we earmark $10 for breast cancer organizations. In 2015, that meant $4,000 shared equally by two nonprofits, the Lebanon-based Pennsylvania Breast Cancer Coalition and the Middletown-based Feel Your Boobies Foundation. In the United States, approximately 40,290 women are expected to die from breast cancer in 2015, according to breastcancer.org. However, death rates have been decreasing since 1989 as a result of treatment advances, earlier detection through screening, and increased awareness. With proceeds from the sale of our Power of Pink bouquet, Royer’s recently donated $2,000 to the Pennsylvania Breast Cancer Coalition. Ten dollars from each bouquet sold is earmarked for breast cancer groups. The bouquet is available year-round. Based in Lebanon, the PA Breast Cancer Coalition represents, supports and serves breast cancer survivors and their families in Pennsylvania through educational programming, legislative advocacy and breast cancer research grants. Photo, Jennifer Pensinger, executive director, PA Breast Cancer Coalition, is flanked by Royer’s Barry Spengler, vice president of operations, left, and Tom Royer, senior vice president. Royer’s recently donated $2,000 to the Feel Your Boobies Foundation. The donation reflects proceeds from the sale of our Power of Pink bouquet, which is available year-round. With every bouquet sold, Royer’s earmarks $10 to breast cancer organizations. A Middletown-based nonprofit, Feel Your Boobies promotes proactive breast health in young women. The foundation’s college outreach program provides free breast health education materials to nearly 200 college health centers in 38 states. Photo from left: Barry Spengler, vice president of operations, Royer’s; Leigh Hurst, founder/president, Feel Your Boobies Foundation; Tom Royer, senior vice president, Royer’s. Among the arrangements debuting with our 2014 fall catalog is the Power of Pink bouquet. It packs plenty of pink: a 9-inch pink vase holds an all around arrangement in shades of pink, featuring a lily, gerbera, three roses, alstroemeria, carnations, mini-carnations, caspia and a sheer bow. As for power, that derives from the good we hope it does in the fight against breast cancer. October is National Breast Cancer Awareness Month. Approximately 40,000 women in the United States are expected to die from breast cancer in 2014, according to breastcancer.org. The much better news is that death rates have declined for decades, there are millions of breast cancer survivors, and the fight for a cure continues. 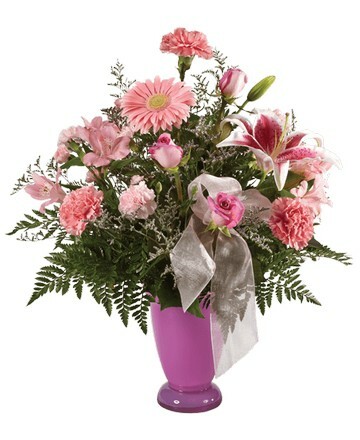 This is why for every Power of Pink arrangement sold, we are donating $10 to breast cancer research. We are committed to this cause, so we’re offering this arrangement year-round. Meanwhile, if you are a woman between the ages of 50 and 74, the Centers for Disease Control and Prevention recommends that you have a screening mammogram every two years.